THE SHOWBIZ LION: FANCY A PIECE OF HEAVENLY TRAINSPOTTING CAKE? 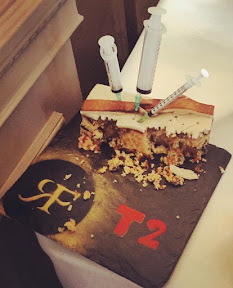 THIS is the remainder of the less than tasty cake enjoyed by Ewan McGregor and the cast of T2 Trainspotting at a private party in Edinburgh's Balmoral hotel. The sponge, complete with stick out syringes was ordered specially by Danny Boyle's team for an intimate party at the posh hotel just before the premiere. The real medical syringes were stuck into the sweet treat and served up with each portion. According to one insider some of the party removed them for a laugh and asked surprised staff to fill them with booze and put fruit on the end. The cake was just part of the big celebrations to mark the release of T2 Trainspotting, 21 years after the original. Following this week's premiere and a walk on the orange carpet, Ewan McGregor, Robert Carlyle, Jonny Lee Miller, Ewen Bremner, Kelly Macdonald and the gang headed to Edinburgh's Caves for an official after party. 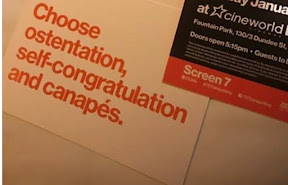 Invitations to the exclusive bash where Irvine Welsh once held a party for Skagboys read: "Choose ostentation, self congratulation and canapés." While crew and cast members partied it up, a giant picture of the four lads was projected onto the walls. The cast then made their way back to the hotel for around one am where they held their own private celebrations. While Ewan sat in the Scotch whisky bar, with Ewen Bremner and Danny Boyle, Jonny Lee Miller and a party including actress Sadie Frost chose to sit in the Brasserie.